The Republic Gunship is one of the coolest vehicles in the Star Wars Universe and the 3rd version of this versatile ship has been added to the Revenge of the Sith Visual Guide today. The ships sports an all new paint job and the boat load of features like its brother including firing top and nose cannons, the clone drop platform, bay doors that swing open with the push of a button and more! Need to add another Gunship to your fleet? Alliance Collectibles that and more so stop in today and place an order! The latest update in the JTA Collector's Room is, well, mine! After years and years packed away in boxes I was finally able to begin to take them out and display some of my collection...there is still a bunch of setting up to do, but there's plenty to look at, so head on over and check out Pete Windu's and don't forget to send us yours!! A special Sunday update with an entire wave of Galactic Heroes from the Revenge of the Sith! The 2nd wave includes Chewbacca & Clone Trooper, Mace Windu & Kit Fisto and R2-D2 & Super Battle Droid! Check them out by clicking the images below or by visiting the Galactic Heroes to the Visual Guides! Brianstoys.com sends us their latest newsletter, featuring the latest from Master Replicas: Mace Windu Force F/X lightsaber, and Yoda's LE lightsaber. They are also taking preorders on the highly anticipated clone varients. You can read the whole newsletter at Brianstoys! We are now accepting advance orders for the final twelve 2005 Revenge of the Sith figures. You can choose to take delivery from our early shipment or the regular shipment. We are and will continue to be your source for all exclusive figures. The upcoming Bounty Hunters 7-Pack is available for pre-order. We still have some Wedge Antilles available for pre-order. Solid 12pc cases are available at request. Coming soon will be the new Astromech Droid 5-Pack sets: Imperial and Rebellion. The Darth Sidious Limited Edition Lightsaber from Master Replica is in stock and now shipping. Order now and get it below retail and free FedEx shipping! This is an absolute must have for the Star Wars collector. All three Evolutions sets are available for order: Anakin Skywalker to Darth Vader, Clone Trooper to Sandtrooper and The Sith. We know how popular army building is, so we are offering solid cases of the Clone Trooper to Sandtrooper set. New battlepacks are available as well: Jedi vs Sith, Jedi vs. Separatists, and Rebellion vs. Empire. You can start shopping for all of this and much more at Andrew�s Toyz! The Force Battler updates continue, and this time it's the 1st version of Darth Vader. Head on over to the Young Kids Visual Guide to see more in this unique line, and head over to Alliance Collectibles to order these and more. You can see the new addition by clicking below. The Star Wars Shop has but up a few fantastic exclusives today...the Gentle Giant Studio Scale Star Corps Trooper Helmet Replica is limited to just 600 world wide and you can only get it at the Star Wars Shop! And the Japanese Real Action Hero Darth Vader and Jedi Luke Skywalker have also been added for pre-order! Stop by the Star Wars Shop today so you don't miss out on these fantastic exclusives! Gentle Giant wants to remind you that they'll be at WW Chicago next week and they have been authorized to take pre-orders for a Chrome Darth Vader statue with light-up lightsaber blade and for the life-size Yoda with light-up lightsaber and sound!. They're not sure when they can offer another pre-order session for these two pieces so be sure to take advantage of this opportunity so you will be guaranteed to receive the pieces. We're finally getting out from under the ROTS pile and today we are adding the second of the Force Battlers to the Visual Guides. Obi is equipped with his lightsaber a blaster rifle and a backpack with breather...squeeze his legs together and he's swings into action! Alliance Collectibles carries all your collecting needs so head on over today and see what they have in store for you! The new Force Battlers line is now officially open here at JTA, nested nicely in our newly restructured Young Kids Visual Guide. Chewbacca is the first one to appear. Click on the image below to see what this new line looks like up close! Also in the Young Kids Visual Guide is the new M-Pire figures, Jedi Force, and Galactic Heros. The Star Wars Shop now has available for pre-order the "Hunt for the Millennium Falcon" Bounty Hunter Action Figure 7-Pack. The multi-pack comes in the new Saga Collection packaging and includes Darth Vader, Zuckuss, 4-LOM, Dengar, IG-88, Bossk, and Boba Fett all for just $34.99. The 7-pack is limited to just 10,000 pieces. Head on over to the Star Wars Shop and order yours today! Toy Fellas has two new & great items hot off the truck! The Comic-Con Exclusive Holographic Leia only $35.99 - will ship in a protective case and Family Guy Series 3 Figures only $11.99 each! Head on over to Toy Fellas today! The origins of Anakin is such old news by now...we all know he was created by JTA to help us conduct business! The new poll focuses in on all the glorious (or not so glorious) clone troops that Hasbro is giving us the second half of the year...what size army will you build? Vote and let us know! Federation Toys wants to let you know that they have items in stock including the ARC-170 and Anakin and Mace Windu Revenge of the Sith F/X lightsabers from Master Replicas!. Check site for details. They also have a limited number of the Star Wars Celebration II souvenir program collector's book. This is a busy year for toys so keep checking back for more great new stuff! They will also at WIZARDS World CHICAGO 2005, next week, and at Chicagoland Entertainment Collector's Expo, in September!! Stop by and see all they have in store for you and don't forget to tell them that JTA sent you! Check out their front page for all the links and info and show dates! Another huge guide has been added over in the Revenge of the Sith section today...the Mustafar Final Duel Playset! Loaded with action features like break away bridges, swinging ropes, exploding volcanos and lava slides this is one cool set! It also includes Darth Vader and Obi-Wan figures! Check out the images below and if you still have not picked one of these up, hop on over to Alliance Collectibles and pick one up today! Our pals over at TPU have a huge competition running to win over �1000 GBP worth of SW goodies. You can either e-mail them your entry or become a forum member and gain 'multiple' entries by posting. Entries can be from anyone anywhere in the world. Check it out right here. The Revenge of the Sith updates continue, this time featuring Anakin Skywalker's green Jedi Starfighter. This one comes complete with Anakin Skywalker (previously released as basic figure #02 in the ROTS line). Click the images below for detailed views of this Toys R Us exclusive, and check out Alliance Collectibles for a great selection of ROTS toys! OK...Just about everyone has been quoting an article here and a article there about the release date of the Revenge of the Sith DVD and now we can make it as official as ever with this report from the Official Site confirming November 1st as the date! Battlefront II will be released the same day so time to ask the boss for the day off...November 1st is going to be busy! Our Collector's Room get's its first update since we launched our new format. Julián Bagnasco sends us his collection all the way from Argentina. Stop by and have a look at Julián's collection, and if you want to see your collection showcased at JTA then send the pictures to collections@jeditemplearchives.com! Action HQ - bringing the Best to you FIRST with a Star Wars Evolution The Sith & Trooper 3-Packs, New 3.75" Star Wars #51, #52 & 53 assortment figures, Kaiyodo Trigun Gazzelle the Peacemaker - The Black Beast Special Re-Paint and More! We sifted through al the entries for the July Caption Contest and came up with a winner last night! Jedi Temple War Room forum member Lava Vader came up with the most unique caption of the bunch and wins the autographed photo by Bodie Taylor! Congratulations to our winner and check back next week when we kick off a new contest sponsored by the Autograph Bounty Hunter for another great prize! The only thing better than having an army of Wookies is having a bunch of Wookie vehicles to go with them. Today the Wookie FLyer is added to the Revenge of the Sith Visual Guide. The FLyer comes complete with a Wookie Warrior to pilot the craft and the Flyer itself has flapping wings, a canon and a seat for a co-pilot! Don't forget to head on over to Alliance Collectibles to pick up all your army builders! Our monthly contest sponsor, the Autograph Bounty Hunter writes in with some incredible news on his latest bounty! The Autograph Bounty Hunter has tracked down another obscure character: the Death Star Trooper! He was able to convince British actor Harry �Aitch� Fielder to participate in a private signing. There are three photos to choose from and personalization is possible. All autographed photos will be $25, shipping in top loader and COA included. Another world exclusive from the Bounty Hunter. Happy hunting! This is it, the last weekend and last chance you have to enter this month's Caption Contest! All you need to do is jump on over to the Contest Page, check out the goofy drawing and make an even goofier caption and a 100% free autographed Bodie Taylor photo can be added to your collection! Don't miss out! In stock now at Andrew�s Toyz is the Master Replicas Darth Sidious EP3 Limited Edition Lightsaber! This is an absolute "must have" for the Star Wars collector. Order yours at Andrew�s Toyz and get it at a very low price plus FREE FedEx shipping! Many more Master Replica items are available for order as well. All three Evolutions sets are available for order. We know how much collectors like army building with Clone Troopers, so we are offering the Clone Trooper to Sandtrooper set by the case at a great price! Now you can get all the Clone and Sandtroopers that you need for your armies! The Sith Lords Evolutions set is available along with the Anakin to Darth Vader as well. We have received new photos of the Exclusive Wedge Antilles figure. It looks like the figure will have more articulation and better sculpting than shown in previous photos. 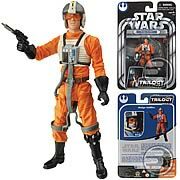 Remember Wedge Antilles is only $14.99 at Andrew�s Toyz! Brianstoys.com announces that they have a load of exclusive Master Replicas lightsabers in stock...Darth Sidious Gold [Best Buy], Darth Vader Gold, Obi-Wan [Celebration 3 Exclusive], Obi-Wan Gold [Celebration 3 Exclusive] and Yoda [2005 Convention Exclusive]...and don't forget about the Holographic Leia! Stop by and check them out along with everything else packed into their latest newsletter! Felucia Scout Patrol: Felucia was a world teeming with fungal life-forms and immense primitive plants.Beneath the hazy canopies of the enormous pitcher plants and leafy growths is a surreal color-drenched landscape where an infantry unit of Republic scouts are	on routine patrol assignment. IHQ Main Docking Bay: The Millennium Falcon rests beyond the stolen Imperial Shuttle, which looks anomalous among all the Rebels ships in the vast docking bay crowded now with all the rebel strike teams loading supplies and crew. The good guys over at Sandtroopers are celebrating their 5th birthday and they are doing it in style with daily giveaways! If you wanna learn how to win something...or more importantly, how to help stop scalping, stop by the Sandtroopers Sandblast today! Our collections page has been revamped with a new format that we think everyone will like. Head on over to check out the new layout by clicking on one of the current featured collections! And, if it looks a little empty right now, that's because you haven't sent your collection in yet! You can have your collection displayed here by sending your name, where you are from, and pictures here. If you have sent your collection in in the past and do not see it featured, please resend it to the above address. The last Star Tours figure from wave 4 is now added to the special exclusives visual guide. You can check out the brand new image below! EntertainmentEarth.com has an image that we are all sure you'll like...an updated non-buff Wedge Antilles! A huge relief for all collectors to be sure. Click the thumbnail below to go to EE, take a closer look, and now that it looks cool, maybe even buy one or two! All right...here are G3-5LE and MSE-1T from the latest wave of the Star Tours line! These two, actually all three, are some of the nicest of all 4 waves so if you like the Disney Droids these are not to be passed up. You can give them a ring at 407-363-6200 to place you order...they sell for $10 each. Star Tours wave 4 is finally out there and we have the carded images you have been waiting for! This wave is on Post-OTC cards which has a star field background. Check them out below and look for loose images later on! Clones! Today we have added the first of five known Clone 3-pack variations. Using the same concept of the Clone Wars Clone 3-packs these clones have limited articulation...just at the shoulders, but offer a way to add a bunch of clones to the army or diorama at a decent price! Check them out below or in the Revenge of the Sith Visual Guide. The San Diego Comic Con Holographic Princess Leia is now up for sale again at the Star Wars Shop...limit 1 per customer, so hurry while they last! Click here to order yours now! Our Taget exclusive cup updates continue, with Boba Fett joining the Revenge of the Sith Visual Guide. No, he is not from ROTS, but does sport the cool ROTS packing, so he will enjoy a home in our ROTS guide. This Fett is basically the same Boba Fett offered during the Saga (2003) and OTC lines, except he lacks the flames and blasterfire accessories. Amazon.com has the Hoth Battle Pack up for Pre-Order. The site currently says it will be released on September 5 and is going to run you just $24.99...not bad for 5 figures! Tonight another of the Target cup & figures sets have been added to the Revenge of the Sith Visual Guide today. Obi-Wan Kenobi in all his Revenge of the Sith greatness joins the crows. The figure is the same as your ROTS #1 figure and the glass is brand new and shows the scene with him in a battle with his friend and brother! So, you could not make it out to San Diego...maybe you did and you just want a few more...the San Diego Comic Con Holographic Princess Leia is now up for sale to everyone at the Star Wars Shop! Click here to order yours now! Time is running out folks as we are down to our last week in the July Caption Contest. It could not get any easier than this...all you need to do is sign up for the forums and send in the funniest, goofiest caption you can for the drawing on the Contest Page. You'll never get an autographed Bodie Taylor photo without less hassle and for sure you'll never have more fun trying to get it! Hasbro reports that it's earnings are up over 50% over last year due in part to very strong sales of Star Wars merchandise. Hmmmm...and they still cancelled the 7" Unleashed. Read more right here. Check out the latest Brianstoys.com newsletter featuring all of the latest Unleashed figures. Get them before they all shrink down to 2 inches! Click the banner below to see all the deals at Brianstoys! Today was the big day for that other Star Wars party! Forget San Diego! Cincinnati, OH was the place to be if you were celebrating with the OSWCC! A large group of us KSWCC members made the trek north to join them. Food, fun, buying, selling, give-aways, and just about everything else Star Wars took place today as the Ohio group held their annual Summer Social! As a matter of fact, this was such an awesome fan get-together that it is now part of JTA's Star Wars Experience. Check out our coverage in the SW Experience section! It just has not been my day with computers but if you have noticed we finally have images up of all the great stuff that is happening out at the San Diego Comic Con...even if it did take me all day to get them there for you (had to go see ROTS again!) Check out the full story and all the images in the San Diego Comic Con experience! The last of the basic figures from the first 50 released is now in the Revenge of the Sith Visual Guide. The army builder wookie color variation, the light wookie, can be seen by clicking the image below. Lucasfilm announced a new branch: Lucas Animation. Lucas Animation will be responsible for bringing us the new Animated series in the Fall of 2007, which will take place between Episode II & Episode III and will be 30 minute episodes. The live action will premiere sometime after that. The got to preview one of the many deleted scenes that will appear on the DVD this fall: The birth of the Rebellion with Mon Mothma, in its entirety. A few of the many items being worked on for 2006: Boba Fett's Blaster, a 28" scaled Millenium Falcon, and a studio scale Y-Wing. They hinted of a new License, while showing the staff that Indy used in Raiders of the Lost Arc. They are expected to announce the Indy License tonight at the private Master Replicas party. Hasbro unveiled their new line of toys in a new showcase. The new unleased figures premiered (2" scale) with many characters (more on that later). New 'Titanium World' playsets unveiled. Fill it up with a Coke, water or just put it on a shelf next to the Burger King glasses you have...the Target Exclusive Yoda (from the POTF2) and Collectors glass have been added to the Revenge of the Sith Visual Guide today. We got some minor updates from San Diego in the Gentle Giant Section with the addition of a Yoda Statue with a light up lightsaber and the Code 3 Section has an update that includes the 1:38 scale Darth Vader TIE Fighter! We experienced some technical difficulties with the image transmissions, but we promise you'll have something to look at later in the day! And so, at long last the deluxe line is complete over in the Revenge of the Sith Visual Guide with the addition of the Green Vulture Droid. Same mold as his blue counter part, just with different style! With all the buzz going on at the SDCC you know you want to buy more toys...head over to Alliance Collectibles and feed that toy craving of yours! Andrew�s Toyz has the Internet Exclusive 2005 Wedge Antilles action figure available for pre-order. Only $14.99 ea. When you pre-order today! Go to andrewstoyz.com to order now! Scientists have found a planet outside our solar system that orbits not one, or two stars, but three stars. With memories of Luke Skywalker looking at the dual sunset over the Dune Sea scientists have named this extremely rare find a "Tatooine Planet". Just a fun piece of news to show how far stretching the Star Wars Saga is. Read the whole article at CNN Science & Space. The Code 3 Revenge of the Sith 3D Sculpted poster that was announced at the SDCC is up for pre order for Collectors Guild Members only...Click Here to head on over to Code 3 and place your order! This weekend, the OSWCC are having their big Summer Social, and they have invited us Kentucky boys up to enjoy the party! the KSWCC's normal monthly meeting will be combined with the huge annual summer social in Cincinnati, OH this Saturday. There are tons of activities planned. If you live in Kentucky or Ohio and belong to either club, be sure to join us for what is sure to be the biggest Star Wars party East of San Diego! Tim sends in a Jedi Transmission to let us know that the 4th wave of the Titanium Series is on display featuring Anakin's Green Jedi Starfighter, the Queen's Royal Starship, Battle Damaged Falcon, and Wookie Helicopter. They also have the Wal*Mart gift pack we saw at CIII on display. The new 6" scale Droid Tri-Fighter, Republic Gunship, and X-Wing are out for all to see, along with a cool surprise...a 3-3/4" Boba Fett! All this and more can be found in our SDCC 2005 Hasbro Section. Images will be up later, so keep checking back! Jedi Transmission from the SDCC Gentle Giant booth has some stuff that will blow you away...the Darth Maul statue that you all have been waiting to see is on display, as well as a new diorama - Luke Skywalker on his Taun Taun! The SDCC 2005 Gentle Giant page will keep a running list of what to expect from Gentle Giant in the next few months. Images coming soon! This next Jedi Transmission from Tim is about the cute little Galactic Heroes. Another wave is on display in San Diego that includes Yoda & Kashyyyk Clone Trooper, Darth Vader & Holographic Emperor, and Anakin Skywalker with either a Special Ops Clone Trooper or a Orange (Utapau) Clone Trooper). See the entire list of Hasbro news in the SDCC 2005 Hasbro Section. Another Jedi Transmission from Tim has come in about the events at the San Diego Comic Con...this time it is Hasbro News! Tim reports in of the next 12 basic figures for the Revenge of the Sith Line, vehicles, and exclusives. Three more Target Exclusive Cup Sets will also be on tap with Vader, Leia and a Stormtrooper! Read more about it in the SDCC 2005 Hasbro Section. Images will be up later, so keep checking back! Code 3 is running their news through the Jedi Transmission channels and if you are a fan of the 3-d Sculpted posters then you'll love the new Revenge of the Jedi 4 x 6 poster that will be up for pre-order in San Diego! Check in at the SDCC 2005 Code 3 page for more news as it is released!. Images will be up later, so keep checking back! Ever since Sideshow Collectibles hit the Star Wars scene last year fans have been crying out for them to take over the 12" figure line. Well, in a partnership with Hasbro the fans will get their wish! Keep checking in at the Sideshow Collectibles web site and right here in our SDCC 2005 Sideshow Section. Gentle Giant has updated their web site with images of the Clone Wars Barriss Offee and Luminara Unduli Maquette and news of Bust-Up Series 5 - Battle of Hoth. The fifth set of micro-busts includes Hoth Han Solo, Hoth Luke Skywalker, Wampa, AT-AT Driver, Snowtrooper and DarthVader. Click the images below to take a closer look! Star Wars Shop Exclusive: Wedge Antilles! Offered on a card for the first time ever, Wedge Antilles will be the next figure exclusive from StarWarsShop.com! This is a repack from previous Wedges, but for carded collectors it is about time! He'll also be sporting a StarWarsShop.com-branded collector star case. He will ship out in October, so head on over and pre-order yours today! In one of the coolest of the ROTS deluxe figures, the 'Rebuild Darth Vader' set comes with a nicely detailed medical table, a partially assembled Anakin/Vader, and the ability to connect Vader's medical droid directly to the medical table (although I don't remember lava flowing inside of the medical center!) With the deluxe section of the Revenge of the Sith Visual Guide nearly complete, look for more ROTS visual guide expansion in the coming weeks! With more than 30 guides done this month alone, the ROTS guide grows nearer to completion each day! The Jawa is on fire! Now they have images of the Assault on Hoth Battle Pack and the Jedi Temple Assault Battle Pack. Follow the links to see the goods!! Stass Allie crashes her way into the Revenge of the Sith Visual Guide! She comes with a nice BARC speeder, with (supposed) exploding action ala the vintage line of speeder bikes. Check out the guides below, and don't forget that Alliance Collectibles has this and more from ROTS! This is in from our pals at Rebel Scum...Word of the new OTC card design and really bad news about the figures that we'll find inside them...including speculation that there will be new thing packed with old things to make us buy old things again...Click here to read the grim details.. The folks over at The Jawa have done it again...a few days ago it was the word of the Imperial Force Hoth Battle Set and Jedi Temple Attack packs and now they found some images of another Diamond Excluisve...the Bounty Hunter Hunt for the Millennium Falcon 7-pack! Want to know who's included and see images...hop over to The Jawa and read the article right here! The Jawa has just posted full details of both the Imperial Force Hoth Battle Set and Jedi Temple Attack packs including info about sculpts, paint aps and the works!! Click here to read up on these exciting new multi-packs! On Friday 15th July, the Autograph Bounty Hunter will launch his next Sith Signing, containing no less than 20 images of Anakin Skywalker from Episode III. All are hand signed by Hayden Christensen and come with a COA. First come, first served! So mark that date on your calendars and don't forget...this is one autograph you don't want to miss out on! Today's Revenge of the Sith Visual Guide update is of the fearsome Crab Droid! This droid features a firing rocket blaster and walking motion with the push of a lever! You'll need an army of these gous...stop by Alliance Collectibles and enlist a few for yourself...don't forget to check out one of those Anakin to Vader Evolution sets while you're at it too! AllTroops.com is celebrating it's 3rd Anniversary! It's hard to believe it's been three years since we opened our site to giving collectors the world over the tools to manage their collections online, but July 10th, 2002, we broke new ground and changed the face of the Star Wars fan/collector site. Sure, there have been vast improvements over what utilities we offered since then, but that's the advantage in progress. As we usher in a new era of AllTroops.com, with more toylines and a few more utilities on the way, we open up our Third Anniversary Giveaway: One Giveaway - Two Prizes! A Premium Membership prize and a Standard Membership prize awaits all entrants. And entering is easy - as long as you are an AllTroops Member, simply make a post in the Giveaway thread and you're in. The opportunity closes on July 25th, 2005, so get over to AllTroops now to participate! We're already at July 10...just 2 weeks left to this months contest here at JTA. Head on over to the Contest Page, read up and enter...for a shot at a autographed Bodie Taylor photo, don't pass this opportunity up! Visual Guide Update - Unleashed! Man, it's really hard to understand the rumor of the Unleashed being discontinued when we get a wave like this. Today we have added the likes of Asajj Ventress, Darth Vader (#3) and Sidious vs. Yoda to the Unleashed Visual Guide! All three of the stunning pieces can be seen by clicking the thumbnails below! And, if you would like to add these to your collection, don't forget to stop in at Alliance Collectibles and pick up a set...they are sure to go fast since could be the next to last wave of this fantastic line! Clone, Star Tours, and 5-packs, Oh My! No...we're not shy about sharing rumors and finds with you that pop up at "other sites" and it is a good thing too because today the internet is oozing with info! The good old guys from my home state and collecting club at the NJSWCC report that the contents of not one, but two 5-pakcs that will be hitting the shelves this fall! Read this article over at Galactic Hunter to see images of the new #6 Clone Trooper repainted with Shock Trooper marking and the #33 Clone Commander with Green markings! They also report that the forth wave of the Star Tours figures have finally hit the pegs (and I was just about ready to delete them from the checklists! )...and all decked out in the Post-OTC packaging. Click here to read and see more! Brianstoys.com now has the 500th Vader shipping! Also in stock are the Mpire Wave 2 and Exclusive Jedi Starfighter with Anakin!!! Need some Galactic Heroes or maybe something a little more substantial like an Attakus statue...just click below and start shopping! AndrewsToyz.com is the only source you need to get all your Star Wars figures and collectibles! We have always carried the Hasbro line, and recently introduced the Gentle Giant product assortment to our website. Now you will find Master Replica items at Andrew�s Toyz! We sell it all: Limited Edition lightsabers, Scaled Replicas, Force FX and even Studio Scale products. Our selection of Star Wars is so great and it is even greater because higher end items such as Gentle Giant and Master Replicas are all offered below retail. All Limited Edition lightsabers ship FedEx, at no cost to you! Please see list below for some of what Andrew�s Toyz has to offer! There are tons more Master Replica items available such as the Force FX lightsabers, AT-AT Signature Edition, and more!! We still are your online source for newly released Star Wars figures! All 56 basic figures are available for order. Don�t forget to sign up four our monthly giveaway. To start shopping, go to andrewstoyz.com today! The Revenge of the Sith Visual Guide adds another CIS droid: The Spider Droid. Complete with a firing rocket and walking action. This version is similar to previously released Spider Droids, with an updated paintjob and newer, more detailed cannon. The Official Site has a LEGO update...They are revealing 5 new set for January 2006! Look for the V-wing Fighter (6205), TIE Interceptor (6206), A-wing Fighter (6207), B-wing Fighter (6208) and Boba Fett's Slave I (6208) to fill you SW building needs! We reported this a few week ago when we found them in Hasbro's on line catalog, but now comes official word at the Official Site of the 3rd wave of Tiuanium vehicles! The wave will include the Naboo Fighter, Swamp Speeder, TIE Bomber, ARC-170 and Landspeeder. You can read all about it by clicking the thumbnails below! Alliance Collectibles has the Anakin Skywalker to Darth Vader Evolution set hot off the truck! Also just in stock is the cool Wookie Helicopter with Wookie Pilot! Head on over to Alliance Collectibles and place your order before these disappear! All right...the last of the General Grievous from the basic lines is now in the Revenge of the Sith Visual Guide! The one sports the best paint job of them all had has arms that spring to life while wielding 4 lightsabers! Alliance Collectibles has all your Grievous needs in stock and will have the Anakin to Vader Evolutions set in so soon it could be even now, so stop in and shop away! The last of the Battle Arenas are now added to the Revenge of the Sith Visual Guide. The Utapau Landing Platform Battle Arena pits Obi-Wan against one of Grevious' Bodyguards, which we all know is a mismatch! Obi-Wan should be fighting the General himself! So, pop the general on there and start fighting away! New Unleashed at Alliance Collectibles! Alliance Collectibles has the new wave of Unleashed in stock and ready to ship!! They are sure to move quick so pick up Darth Vader, Asajj Ventress and Yoda vs. Sidious today! Now is the time to add something special to your collection! Hyperspace members can now enter a drawing to have a drawing to wind a set of gold plated lightsabers from Master Replicas. The set includes an 18K Gold Plated Anakin Skywalker and Obi-Wan Kenobi Commemorative Edition Dueling Lightsaber!! Read more by clicking here and Hyperspace members can enter the draw right here! OK...with word that the Unleashed are going to be replaced with some puny 2" figures I think now is the time to let your voice be heard as this is a most confusing move for a most excellent line...Please, head on over to Rebel Scum, check out their latest Poll and let your voice be heard! The Official Site has news about Revenge of the Sith widecsreen card sets that will be released this September! The set is set to contain 80 base cards, 10 Chrome Art Cards from hobby shops and another 10 from retail, 10 Flix-Pix cards (retail) and Autograph Cards (hobby). Read more here or go to the Topps Web site. Action-HQ.com -bringing the Best to you FIRST with Evolution from Anakin to Darth Vader! Comes with numerous accessories! Order by clicking here now. Today is the day when we are starting off our series of monthly contests! This month we have an oldie but a goodie...the Caption Contest! All that is required is that you use your imagination a bit and you could win a cool Bodie Taylor autographed photo! Click here to go to the Contest Page and enter! And remember, all you need to do is click on the contest banner to the right to see the current contest and past results! Well, our pals at Rebel Scum seem to have a clue...from Unleashed to Die Cast, Clones and more...read all about itright here. The Revenge of the Sith Visual Guide introduces the Ultimate Villain... or hero, whichever way you decide to make him! Anakin Skywalker and Darth Vader become one with this very cool set. Click the images below to see the many accessories this deluxe 12 inch figure comes with! Head on over to Alliance Collectibles to order yours today! Check out the new Unleashed figures that we'll be getting from hHasbro this fall over at the Official Site!! On the way are a Revenge of the Sith Chewbacca, AH Han Solo in the trash compactor and a Revenge of the Sith Shock Trooper! Now we're talkin'! AC Pin has more dioramas up for your viewing pleasure! Just click on the thumbnails to enjoy! Jedi Master Obi-Wan Kenobi confronts his former apprentice and friend Anakin Skywalker, who has fallen to the Dark Side amidst the volcanic landscape of Mustafar. On Utapau, the crab droids served as a deadly threat against the clone troopers of General Obi-Wan Kenobi's attack battalions, though brave soldiers able to outrun its targeting sensors found weak spots behind the forward armor that could be exploited. This prototype Theed Hangar shows one section of the N-1 starfighter bays. The hangar becomes a battle scene as the resistance led by Queen Amidala repel the Trade Federation droids. An epic duel between the two Jedi and the Sith also unravels inside the hangar. The vehicles are landing in the Revenge of the Sith Visual Guide! Today's addition is the ARC-170 Starfighter...complete with 2 cockpits that actually hold 3 figures, firing wing cannons, landing gear, bombs and a rotating ail cannon this ship makes the Vulture Droids run and hide! Check it out by clicking the images below. Drop into Alliance Collectibles today to pick up your ARC-170...and a few Clone Pilots to pilot the ship while your at it! Obi-Wan Kenobi's Strafighter (well, the one that was torn up to shreds in the opening scene of the movie) has been added to the Revenge of the Sith Visual Guide today. With firing laser cannons, an opening cockpit, stand in droid and opening wings, this is one of the coolest ships you can add to your collection! Click the thumbnails below to take a closer look. Remember to stop by Alliance Collectibles to pick up your Jedi Fleet today! Brianstoys.com has the 500th Vader now in stock along with Capt. Antilles, Utapau Warrior, Zett Jukaska and Wookie Helicopter along with the 1st wave of the M&M's figures!! Check it out and more by clicking below! New Feature - Star Wars Experience!! What is the Star Wars Experience? It is where you will find coverage of all sorts of events, conventions and happenings to help you connect to the things in the Star Wars Universe that you just could not make it out to. To have a Star Wars Experience all you need to do is click on the link in the site nav menu and you'll be on your way! Each section is loaded with pictures and stories to help bring you to where we (or you...our readers) were! That's right...If you had a great Star Wars Experience and have pictures and stories that you would like to share, all you need to do is send them to us right here and we'll help you have others have your experience! They're back with us at JTA and better than ever! AndrewsToyz.com has rejoined the team and with a store packed with tons of great stuff from POTF2 right through to Episode III not to mention cool stuff from Kotobukiya! We are proud to announce that we now carry the Gentle Giant product line. We will be offering the entire Star Wars Gentle Giant line as items are announced. We have already listed a whole bunch of new items on the site. You will find that when you purchase Gentle Giant items from Andrew's Toyz, you will be saving a lot of money. All Gentle Giant items sold on our site are marked way below retail! Click here to start shopping and saving today! Just feat your eyes on this superb piece by Sideshow Collectibles!! This Old Ben Kenobi is sure to be a huge hit when it hits retail! Click the image below to take a closer look! General Grievous is the next 12" figure to join the Revenge of the Sith Visual Guide. Click on the guides to see him in his various outfits and action poses. He sports 4 lightsabers and he knows how to use them! You can pick up all of the 12" figures at Alliance Collectibles! Well, it looks like they are on their way as they have hit the on-line marketplace...We've got images of the Titanium Series 3 which includes the TIE Bomber, Landspeeder, Swamp Speeder, Naboo Fighter and the ARC-170...check them out by clicking the image below! The 12" figures continue to be added to the Revenge of the Sith Visual Guide today with the addition of the Clone Trooper. Complete with blaster, this bad boy is ready to hunt some Jedi! Who says a 4" army of clones is cool...head on over to Alliance Collectibles and build a 12" army of them...now that's nice!